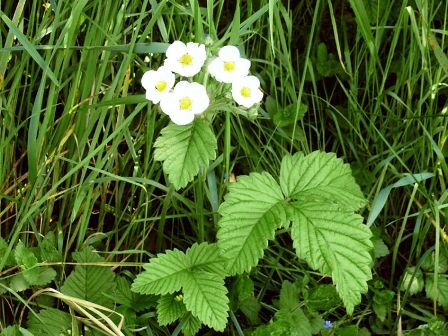 Musk strawberry is native to Europe. It grows wild to a limited extent in forests in Central Europe, north into Scandinavia, and east into Russia. But it has also been under cultivation in Europe since long. Some strawberry connoisseurs rate musk strawberry as the best flavored strawberry. Though its plants can still be seen in many gardens, but still there has been a decline in the cultivation of this fruit during the past 6-7 decades. However, its cultivation is still popular in Italy. A small perennial herb with scant runners growing upto 40 cm; stem hairs spreading sideways–slightly descending oblique. Leaves large, pale green downy, basal rosette, long-stalked; blade palmate, with 3 leaflets; leaflets elliptic, with toothed margins, hairy on both sides, often creased, base of lateral lobes unsymmetrical, central lobe wedge-shaped–blunt. Dioecious; corolla regular, actinomorphic, white, 20-30 mm broad, petals five, 10–12 mm long; cfaly 5-lobed; with epicalyx; stamens 20; gynoecium separate, pistils several; inflorescence an umbellate cyme. Fruit red, juicy, 1–2 cm long, berry almost acheneless; sepals in fruiting stage spreading–descending. musk strawberry fruits has been compared to a mixture of regular strawberry, raspberry and pineapple. 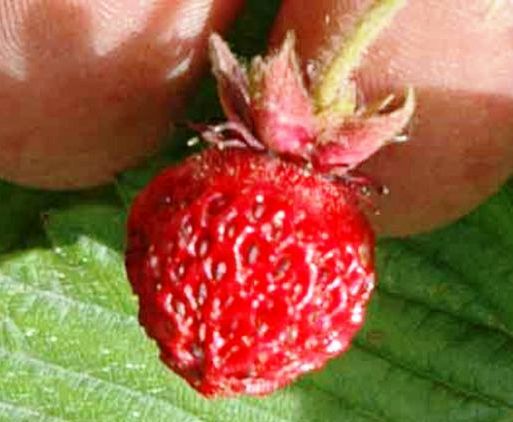 However, the fruits are relatively smaller sized and the production is also not as much as that of the regular garden strawberry. 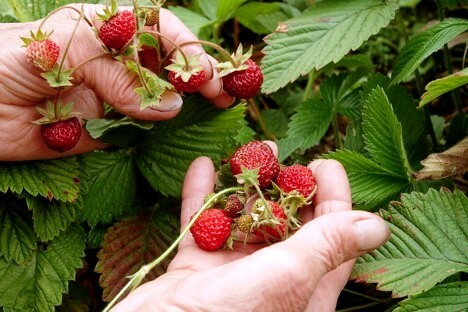 The cultivation of musk strawberry is the same as of regular garden strawberry or Alpine strawberry. Its plants are, however, a little hardier and can therefore grow in a wider variety of weather conditions. The plants perform best in a soil which is rich in nutrients. Musk strawberry is not self fruitful. Even the hermaphrodite flowers would require cross pollination which is achieved by insect pollinators. Several cultivars of musk strawberry are also available. A few of these are Capron Royal, Askungen, Marie Charlotte, Bauwens, Cotta and Profumata di Tortona. 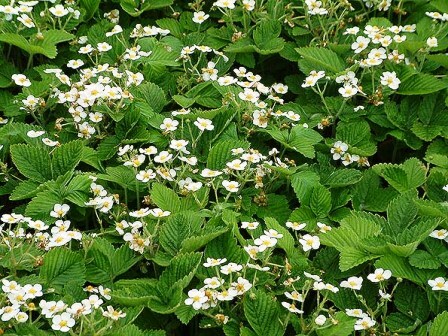 Musk strawberry is also an excellent ground cover plant which spreads very fast with the help of ground stolons forming a dense carpet of growth.